Wittians brought excellent results in National Science Olympiad -2016 organized by SOF. 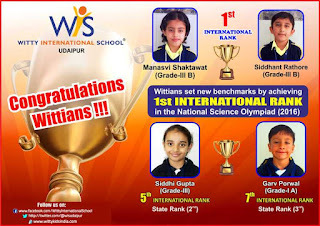 We feel immense pride in sharing that Siddhant Rathore and Manasvi Shaktawat of Grade -3 achieved 1st International Rank,Siddhi Gupta of Grade-3 achieved 5th International Rank and Garv Porwal of Grade- 1 achieved 7th International Rank. 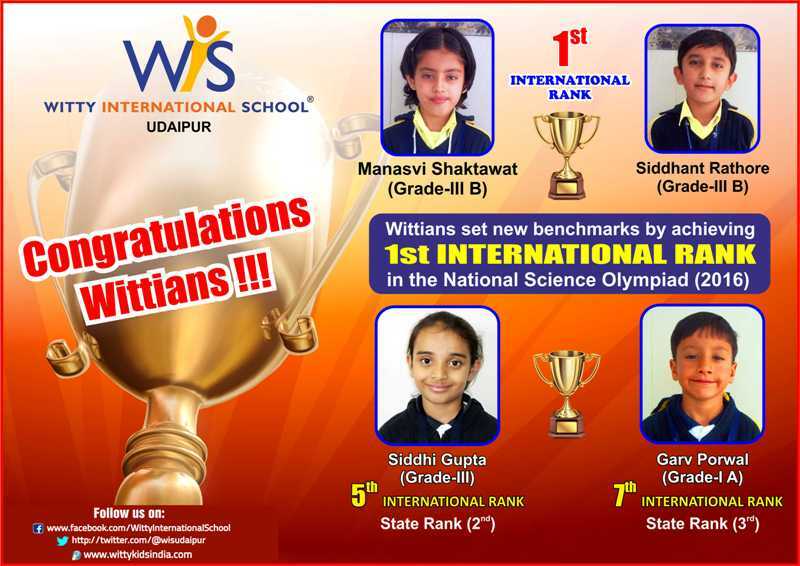 Dheemanth Hebbar, Daham Mansingka, Darsh Sharma , Soham Ghadoliya of Grade 1, Vidhan Doshi, Aryushaditya Agarwal, Garvita Lawati, Siddhi Gupta of Grade -3, Guntesh Singh, Riddhiman Choudhary of Grade -5 bagged Gold Medal of excellence with gifts worth Rs.1000/-. Further with the milestone, achievement, 11 students received school gold medal, 8 school silver medal and 8 school Bronze medals. 19 students from school have qualified for second level of NSO-2016.